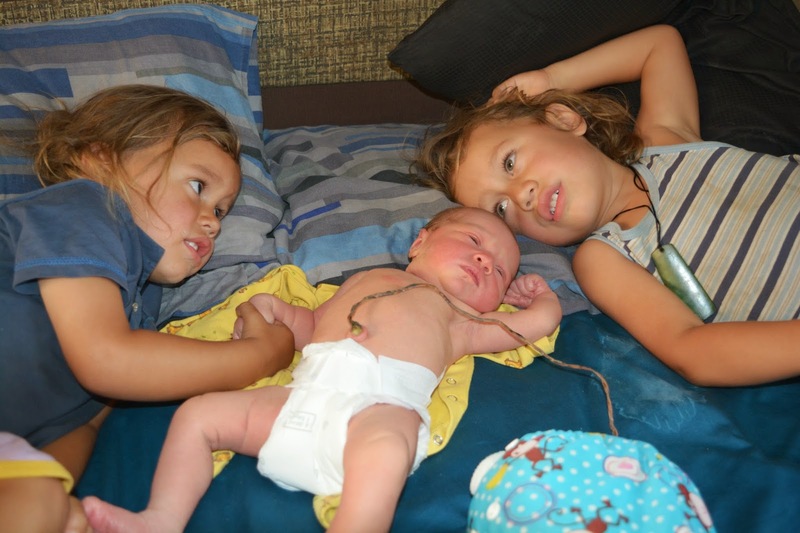 Home > Health > Lotus Birthing – Real Story! as a mother of two kids so far, I’m always curious about other moms’ birthing experience as well as learning new things! A beautiful family of six have been staying with us for over a month now. Sarah, Tamati and their four children aged 13, 4.5, 3 and 4 months have been travelling Australia for 6 months and living in their caravan. Their last child Ella was born on the 31st December 2014 on their way in a birth house in Geelong and Sarah is a promoter of natural lotus birthing (it has been her second so far). I’m so inspired by them and the way how they live! There is so much to learn all the time 🙂 I though I would share Sarah’s story so you can read her personal lotus birth experience. Lotus birth is the practice of leaving the umbilical cord uncut, so that the baby remains attached to his/her placenta until the cord naturally separates at the umbilicus- exactly as a cut cord does- at 3 to 10 days after birth. This prolonged contact can be seen as a time of transition, allowing the baby to slowly and gently let go of his/her attachment to the mother’s body. I gave birth to Ella in a place called “The Birth House” in Geelong, S.Australia. The Birth House is AMAZING by the way!! It’s like a home away from home and the private midwives there are just more than any woman could hope for 😀 It was a lovely, natural, water birth with a physiological 3rd stage, which means that I gave birth to Ella’s placenta without the use of any drugs. I had a bowl which I put her placenta in and it just floated in the water until we got out and got dry, and then it was wrapped up in a towel and left for the night. The next day, we unwrapped the placenta, drained and washed it, salted it, put herbs like rosemary on it, and wrapped it up in a toddler sized disposable nappy, and then an old cloth nappy and nappy cover. We changed the disposable nappy, and put more salt and herbs on the placenta everyday, until Ella let it go. During this time, Ella and I rested, cuddled, stayed close, and enjoyed our bonding time. We were only surrounded by my husband and our three sons, and actually only ventured outside once, to move sites at the place we were staying. It was our baby-moon.. A time to slowly and consciously introduce our babe to the people and the world around her. This was our second lotus birth. Our first was with our 3rd son, and we learnt a few things from his lotus birth that helped Ella’s go smoother and cleaner ;P For my son’s lotus birth, we kept the placenta wrapped up and then in a plastic tray, but we didn’t realize that when we salted the placenta everyday, more and more liquids came out and if there was nothing to absorb those liquids, it started to smell a little. If done properly, it doesn’t smell at all, except for the wonderful scent of the herbs 🙂 This time, I learnt my lesson… Hence the eco-disposable nappies (Although you could always use washable cloth nappies)! I only used four or five, but they worked great! They absorbed all the excess fluid and made change-time and clean-up-time A LOT faster and easier. The day of “Letting go” is always so exciting! To find your little one has decided he/she is ready to be fully conscious in this life is just amazing.. And to put such trust in nature, to know that she knows what she is doing, is such an amazing feeling. It’s absolutely incredible to witness. I encourage everyone to try a lotus birth because it’s a wonderful experience, and I actually see the difference with how much more calm and relaxed the babies are when this natural process is allowed to take place 🙂 But if it’s not for you, I highly recommend that you look deeply into delayed cord clamping to ensure the birth of you babe is the most loving and calm experience possible. Happy Birthing wishes to everyone who is expecting!